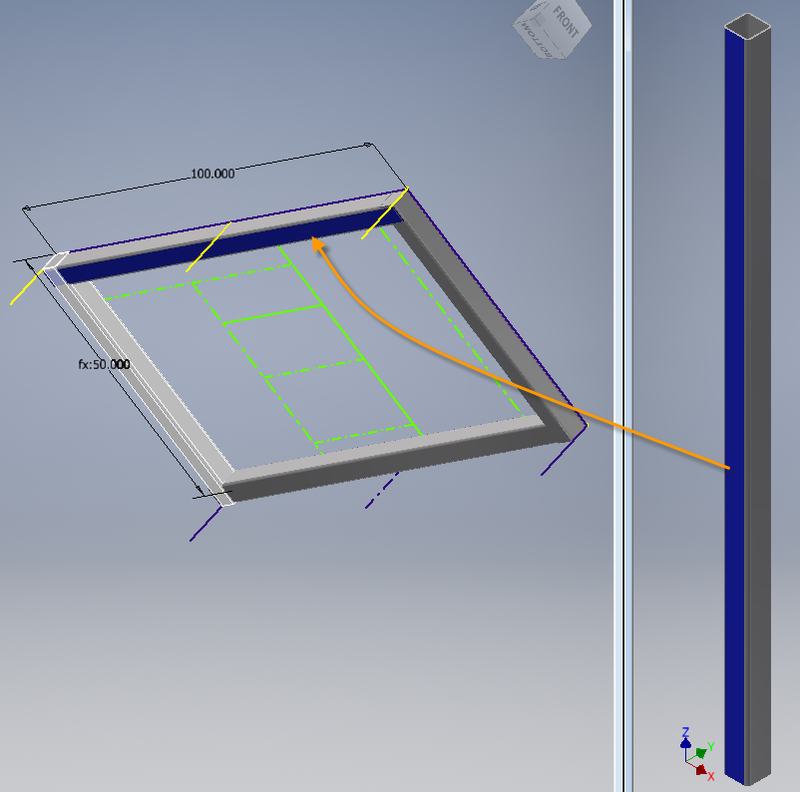 One of my favorite tools in Inventor is the Frame Generator module and when I first started working with it many years ago I took some time to understand how it was created and managed. So today I wanted to share that information with you and pass along some other pointers or recommendations on Frame Generator. I believe the backbone of an excellent frame generator model in the skeleton (frame) that drives it. Though it’s possible to create this skeleton directly within the top assembly, I prefer the method where the user creates it and inserts (placed) it into the top assembly. This user’s defined skeleton is a separate Inventor part file that is composed of sketches representing the edges or centerlines of the structural components. Although 3D sketches and surface edges are allowed, I prefer keeping the sketches straight forward, simple as possible and only use 2D sketching tools. Always set your frame skeleton BOM structure type to Reference. This is necessary to ensure your skeleton does not appear in the frame BOM. To learn more about Inventor BOM structure see my article on it. Use centerline linetypes for sketched lines that represent the structural center path. 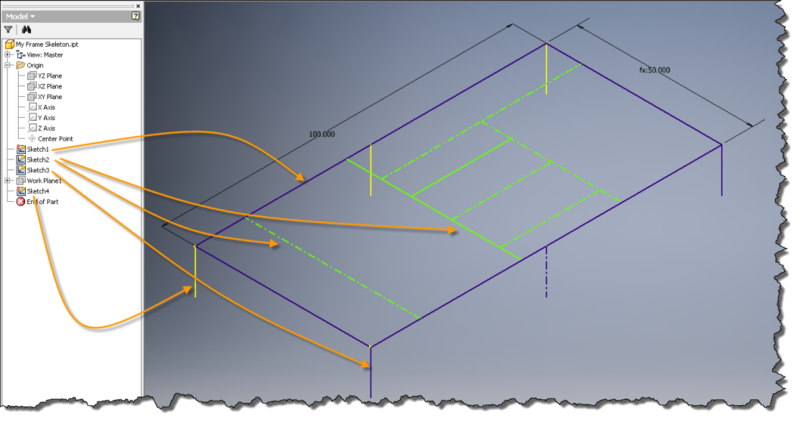 Due to the other frame generator tools/functions, certain sketched lines may not require being accurate, correct length, or even dimensioned. Create multiple (simple) sketches within this skeleton instead of one large complex sketch. Split up complex or large frame designs into smaller manageable frame assemblies. I will touch on this concept later on. Finally build in some simple intelligent (i.e. constraints, parameters, formals) into your sketches to simplify future modifications. However, do not go overboard and complicate the overall design. For example, here’s a screen shot showing how I might divide up a frame skeleton into multiple sketches to convey my design. Sketch #1 is a simple rectangle outlining the overall shape of the frame. Where-as Sketch #2 is associated to the cross members, and Sketch #3 and #4 denotes the frame supporting legs. The frame skeleton does not need to be fully laid out prior to placing it into the top assembly. Now let’s fast forward a few steps and talk about the frame generator structure after the skeleton was placed into the top assembly and we’re ready to add the structural members that make up the outside of the frame/skid. Now when the OK button is selected we are prompted with the following “Create New Frame” dialog. In Field #1, the (file) name that is assigned here is related to the Inventor Frame Assembly. This assembly file is created and managed by Inventor. This assembly is necessary and should never be deleted. In Field #2, the name that is assigned here is related to the Inventor Skeleton or the Frame Reference Model. This part file is also created and maintained by Inventor. Same as the Inventor Frame Assembly, this part is necessary and should never be deleted. 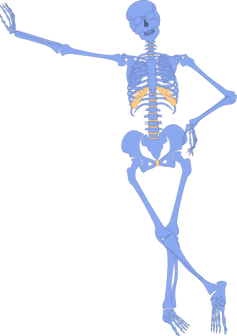 Do not get the Inventor Skeleton file confused with the user created frame skeleton model that I was referring to earlier. 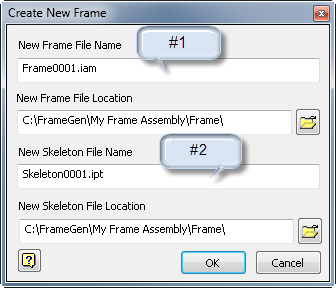 By default all new Inventor Frame Assembly and Inventor Skeleton files are named as shown in the above image. If you’re using Vault or do not want duplicate file names, I would suggest changing their names as needed. For their location, a sub-folder structure called “<top assembly name>\Frame” is created in the location where your top assembly is stored. The Inventor Frame Assembly, Inventor Skeleton, and the frame members are placed in the Frame sub-folder. Although you can change the location, I would prefer leaving it as indicated. Select the OK and if prompted for member file names, adjust as needed. Although the members are shown on the model, the files are not actually created (saved) until the top assembly is saved. So let’s break down the structure by comparing the Inventor Browser view while looking at it in Windows Explorer. 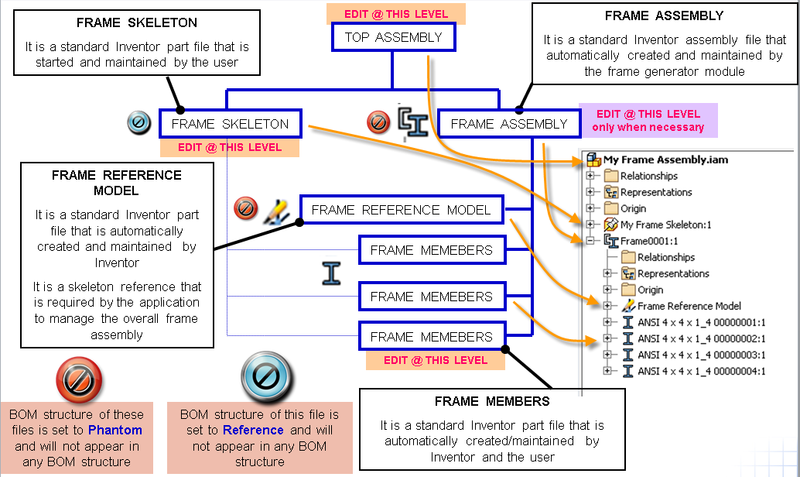 As you can see by the image, the Inventor Frame Assembly, Inventor Skeleton (Frame Reference Model), and the members are stored in the sub-folder location, where as the top assembly is located at the root. No matter what you called the Inventor Frame Skeleton (field #2) the Inventor browser will always display it as the Frame Reference Model. In addition as more members are added to the frame, the members will be stored in the “Frame” sub-folder as well. Now let’s break down the model structure by looking at it in another way. Although I could continue on showing you the tools of frame generator, my goal today was only to represent how this structure is created and maintained. Hopefully this information has helped you and it sheds some light on the subject matter. Earlier in the article I indicated “Split up complex or large frame designs into smaller manageable frame assemblies”. So what did I mean by this? Simply make the smaller frame generator models and then place/constrain them together in an overall frame (top) assembly. Here’s a flow chart representing that concept. Lastly I want to discuss a common question I have received in the past about frame generator. Like most frame or skid designs, certain manufacturing features like mounting holes, slots, and etc. are added to the frame or given members. Should these features be added as an assembly feature, or at the level of the structural member? My answer to this is based on how you manufacture your frame design. Are you first welding all the components together and then drilling/cutting these features? If so, then add them as an assembly feature. If you’re creating them while making the individual parts, then add them at the member level. This now leads me to the file two (2) recommendations. 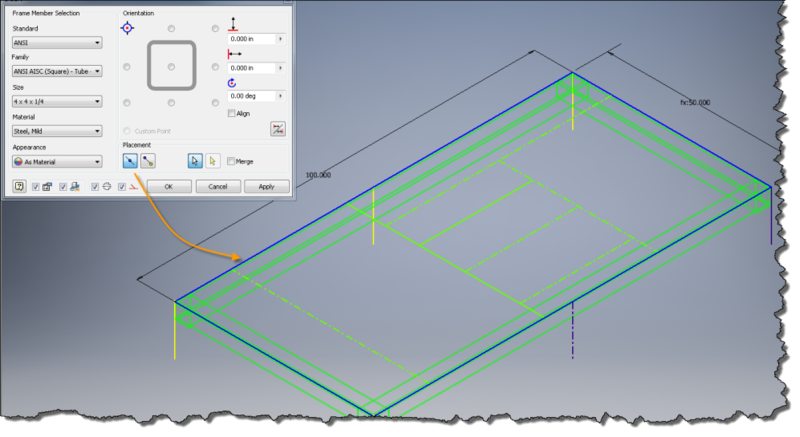 When editing a given frame member, make sure to always toggle the Inventor browser view from Frame Generator to Model in order to see the member modeling features. Without doing this you will not be able to see (or edit) any of the modeling features you added.